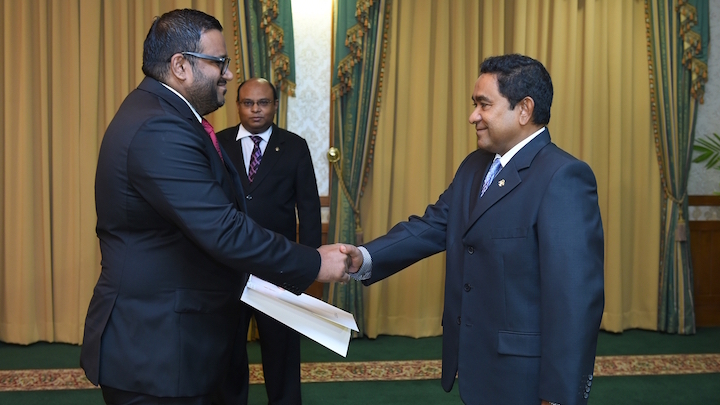 Ahmed Adeeb, the influential tourism minister, has been sworn in as the Maldives’ new vice president at a ceremony at the President’s Office this afternoon. The People’s Majlis has approved his nomination with 70 votes in favor. Chief Justice Abdulla Saeed administered the oath of office before the Majlis vote. The new vice president thanked President Abdulla Yameen for his nomination. He told local media he will only take half of his MVR75,000 salary and will reside at his home instead of the official vice presidential palace. Adeeb will continue to handle the cabinet portfolio on tourism. The seven No votes include opposition MPs Eva Abdulla, Mariya Ahmed Didi, Imthiyaz Mohamed Falah, Mohamed Aslam, Rozaina Adam, and Ahmed Mahloof. The minority leader Ibrahim Mohamed Solih, MDP MP Fayyaz Ismail, Jumhooree Party’s Ali Hussein, and Adhaalath Party’s Anara Naeem abstained from the vote. Adeeb’s appointment comes after the parliament impeached Vice President Dr Mohamed Jameel with multi-party support yesterday. The impeachment process was initiated by the PPM-MDA coalition. Pro-government MPs accused Jameel of incompetence, dereliction of duty, links with the opposition, failure to defend the government, and excessive expenditure from the state budget. Last week, the parliament also approved changes to its standing orders to fast-track the process of voting on a president’s nominee to fill a vacancy in the vice president’s post. The rules were changed to allow the speaker to call for a vote on the day a committee’s evaluation report is sent to MPs. Items are normally tabled in the agenda three days after the committee report is sent out. In late June, the parliament approved a first amendment to the constitution to set age limits of 30 to 65 years for the presidency and vice presidency. Adeeb is 33 years old and was previously ineligible for the post as the constitution required candidates to be above 35 years of age. Opposition MPs’ backing for the amendment was widely perceived as part of a deal in exchange for transferring imprisoned former President Mohamed Nasheed to house arrest. The main opposition Maldivian Democratic Party (MDP) is currently engaged in talks with the government and has expressed hope that the opposition leader could be freed ahead of July 26 when the Maldives marks 50 years of independence. Adeeb’s supporters meanwhile launched a social media campaign backing Adeeb for the vice presidency whilst rumours spread about former President Maumoon Abdul Gayoom’s opposition to appointing the tourism minister to the post. However, the PPM leader has repeatedly denied favouring a particular candidate, stating that the appointment of a deputy is the sole prerogative of the president. Minivan News understands that senior members of the ruling party were split over Adeeb’s appointment. Several PPM MPs had, however, publicly declared that Adeeb would be sworn in before July 26. Shortly after the constitutional amendment lowering the age limit for the vice presidency was passed, the tourism minister reprimanded Gayoom’s son, newly elected MP Ahmed Faris, for his absence from the vote. Vice President Dr. Mohamed Jameel has called his party’s attempt to remove him a “constitutional coup” and suggested that the international community should intervene. The ruling Progressive Party of Maldives (PPM) submitted a resolution to impeach Jameel with cross-party support. A two-thirds majority or 57 votes is required to impeach the president or the vice-president. The petition was submitted with 61 signatures. PPM MPs have publicly accused Dr. Jameel of incompetence and disloyalty. “There is a complete disregard for parliamentary procedure just to get the tourism minister after me. This is personal vengeance,” Jameel said. When asked if he meant Indian government should intervene, he added: “I don’t need to spell it out. But, it is clear what their role should be”. The vice president broke his long silence on the imminent impeachment with a statement on Twitter yesterday. “It is a violation of the people’s rights when a party or an organization, at their whim, without any legal basis, removes an officer directly elected by them,” he wrote. He was not responding to calls at the time of going to press. Senior party officials have said that they are seeking to replace Jameel with Tourism Minister Ahmed Adeeb. Jameel denied allegations of incompetency and told the New Indian Express that he had been carrying out his duty as the President Abdulla Yameen had ordered him to. “The President has to tell me that I have not performed properly, but he never told me that,” he said. In the statement on Twitter, Jameel accused the PPM parliamentary group of greed and said that MPs have arbitrarily amended the constitution for their personal interests. The parliament last week passed the first amendment to the constitution with overwhelming multi-party consensus to set the new age limits of 30-65 years for the presidency and vice presidency. Adeeb is now 33. The constitution previously stated that candidates must be 35 years of age. Dr Jameel left to Sri Lanka last week after President Yameen authorised a medical leave. A senior PPM MP told Minivan News that Jameel had departed to the UK without informing the president’s office. The MP said President Abdulla Yameen has asked the vice president to return to the Maldives and answer to the party’s parliamentary group about his impeachment. However, Jameel told New Indian Express that he obtained permission before travelling to the UK and that he was attending a human rights seminar in London. The ruling Progressive Party of Maldives (PPM) has submitted a resolution to parliament today with 61 signatures to impeach Vice President Dr Mohamed Jameel Ahmed. “We submitted the resolution to the parliament today with 61 signatures collected from PPM, Maldives Development alliance (MDA), Jumhooree Party (JP), and the Maldivian Democratic Party (MDP),” said PPM Baarah MP Ibrahim Sujau. A two-third majority or 57 votes will be needed to remove the vice-president from office. The ruling coalition controls 48 seats in parliament and has secured the opposition’s backing. Six MDP MPs and five JP MPs have signed the resolution, Sujau said. The MDP MPs include Mohamed Nazim, Abdul Gafoor Moosa, Ibrahim Naseer, Ali Nizar, Ahmed Marzooq and Mohamed Abdul Kareem. The five MPs to sign from JP are Ilham Ahmed, Ahmed Mubeen, Hussein Shahudhee, Abdulla Ahmed and Ibrahim Hassan. “A lot more opposition parliamentarians expressed their interest in signing the resolution, but they could not as a lot of them are abroad at the moment,” Sujau said. Sujau said he believes the resolution will pass with an overwhelming majority of 78 votes from the 85-member house. “The numbers send a clear message to the vice president that he should resign before he is impeached by the parliament,” he said. The ruling coalition is seeking to replace Jameel with tourism minister Ahmed Adeeb. 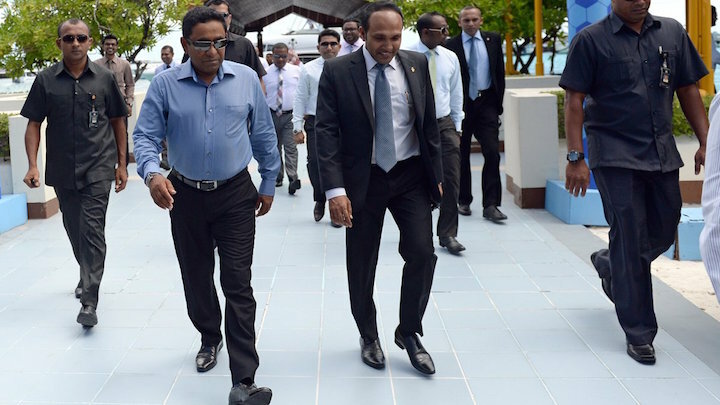 Pro-government MPs have publicly accused Jameel of incompetence and disloyalty. Last week, the parliament passed the first amendment to the constitution with overwhelming multi-party consensus, or 78 votes in favor, to lower the age limit for the presidency from 35 to 30 years. Adeeb is now 33. The opposition’s backing for the constitutional amendment was widely perceived to be part of a deal made in exchange for jailed ex-president Mohamed Nasheed’s transfer to house arrest. Some opposition politicians claim President Abdulla Yameen is fatally ill and wants a more loyal deputy ahead of a life threatening surgery. The government has denied rumours of the president’s health. Jameel is yet to speak publicly about his imminent impeachment. The constitution states that the vice president must be given a 14-day notice and the right to answer the charges before the resolution is put to a vote. Dr Jameel left to Sri Lanka last week after President Yameen authorised a medical leave. A senior PPM MP told Minivan News yesterday that Jameel was due to return three days ago, but instead departed for the UK without informing the president’s office. “We have tried contacting him repeatedly to ask him to meet with the parliamentary group. But he has not responded. We are trying to bring our problems to him and trying to find a mutual solution,” said the PPM MP. Meanwhile, the parliament yesterday approved changes to its rules of procedure to fast-track the process of impeaching the vice president. The new rules state the parliament can vote on removing the vice president without an investigation. The rules previously stated that a committee must investigate allegations against the vice president before a vote. The amendment to the standing orders was passed with 52 votes in favour and 14 against. One MDP MP and several JP MPs joined the ruling coalition to approve the changes. President Abdulla Yameen has asked vice president Dr Mohamed Jameel Ahmed to cut short an unauthorised trip to London and return to the Maldives. A Progressive Party of Maldives (PPM) MP told Minivan News today that the president asked Jameel to return and answer to the ruling party’s parliamentary group over his imminent impeachment. Naib Raees enburi Raajje vadaigathumah Raeesuljumhooriyyaa evves gothakun edhivadaigenfa eh nuvey. Muaz was not responding to calls at the time of publication. Dr Jameel left to Sri Lanka last week after President Yameen authorised a medical leave. The senior PPM MP said Jameel was due to return two days ago, but instead departed for the UK without informing the president’s office. An anonymous senior government official has meanwhile told Haveeru that Jameel phoned President Yameen yesterday and asked for an extended leave of absence. However, the president reportedly told his deputy that he could take a holiday after answering to the PPM parliamentary group. Meanwhile, the parliament today approved changes to its rules of procedure to fast-track the process of impeaching the vice president. The amendment to the standing orders was passed with 52 votes in favour and 14 against. Several opposition Jumhooree Party (JP) MPs and Maldivian Democratic Party (MDP) MP Mohamed Nazim voted in favour of the change. The PPM and coalition partner Maldives Development Alliance (MDA) are preparing to file a no-confidence motion against Jameel this week. A two-third majority or 57 votes will be needed to remove the vice president. The ruling coalition controls 48 seats in the 85-member house and appears to have secured the opposition’s backing. Five MPs each from the JP and MDP have signed the no-confidence motion, the PPM has said. The vice president must be given a 14-day notice ahead of the parliamentary debate on the resolution, according to the constitution. 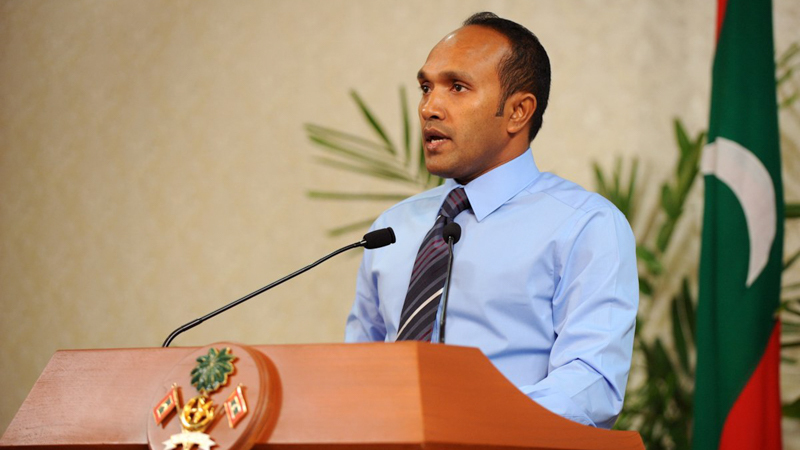 Pro-government MPs have publicly accused Jameel of incompetence and disloyalty. PPM parliamentary group leader Ahmed Nihan said pro-government MPs are unhappy with Jameel over his alleged failure to defend the government during an opposition mass protest in the capital Malé in May 1. The ruling coalition is seeking to replace Jameel with tourism minister Ahmed Adeeb. Some opposition politicians have claimed President Yameen is fatally ill and wants a more loyal deputy ahead of a life-threatening surgery, but Nihan has dismissed rumours over the president’s health. PPM MP Mohamed Musthafa and MDA MP Mohamed Ismail meanwhile condemned the vice president’s departure on social media yesterday. Musthafa said that the president did not authorise Jameel’s trip while Ismail said the vice president had “fled” the country. Ismail said in a Facebook post today that Jameel’s exit lends credence to the allegations against him. He suggested that Jameel was planning to bring the Maldives into disrepute in interviews with international media outlets. Last week, the parliament passed the first amendment to the constitution with overwhelming multi-party consensus to lower the age limit for the presidency from 35 to 30 years. Adeeb is now 33. A parliamentarian of the ruling Progressive Party of the Maldives (PPM) has called on vice president Dr. Mohamed Jameel Ahmed to resign before he is impeached by the parliament. His comments, the first public declaration of MPs intent to impeach Jameel and were made at a dinner hosted by tourism minister Ahmed Adeeb for the party’s young supporters last night. “We do not want to hide what we want to do anymore. 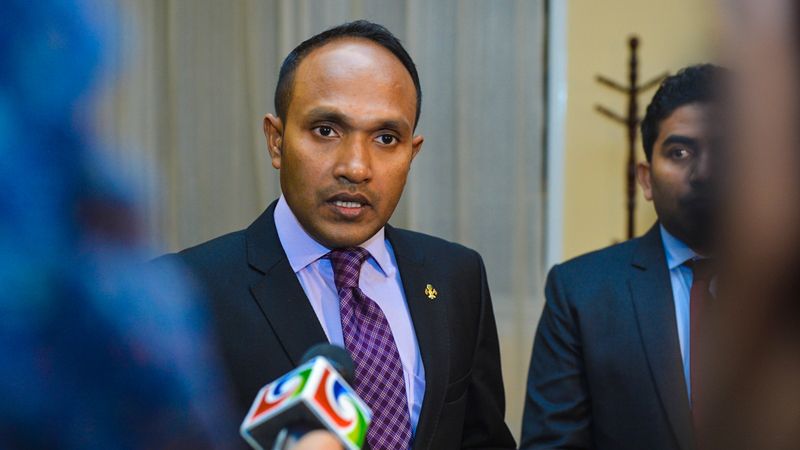 We are going appoint tourism minister Ahmed Adeeb as the vice-president of Maldives before July 26,” said Shujau. July 26 is the 50th anniversary of Maldives’ independence from the British. To impeach Jameel, a two-thirds majority or 57 votes will be required. The PPM and its ally Maldives Development Alliance hold 48 seats in the 85-member house. The parliament on Wednesday passed the first amendment to the constitution setting age limits of 30 to 65 years for the presidency and vice presidency, with overwhelming tripartisan support. Adeeb is 33 and ineligible for the position as the constitution states presidential candidates must be 35 years of age. 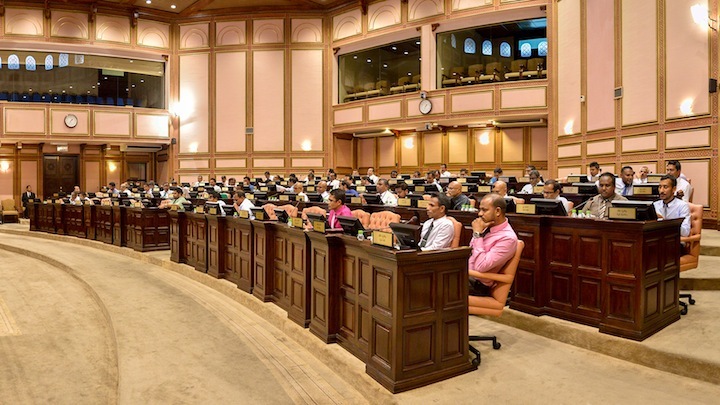 Some 78 MPs of the ruling PPM-Maldives Development Alliance (MDA) coalition and the opposition Maldivian Democratic Party (MDP) and Jumhooree Party (JP) voted in favor of the proposed change. The opposition’s backing was widely perceived to be part of a deal made in exchange for jailed ex-president Mohamed Nasheed’s transfer to house arrest. While pro-government MPs have publicly accused Jameel of disloyalty and incompetence, opposition politicians and some media outlets have claimed that President Abdulla Yameen is seeking a loyal deputy ahead of a life-threatening surgery. The government, however continues to deny rumors over the president’s health. MPs who had voted against or been absent from the Majlis vote yesterday will be sidelined from the political arena. These include MP Faris Maumoon, son of PPM leader and former president of 30 years Maumoon Abdul Gayoom. Gayoom, who is also half-brother to President Yameen, has previously said he rejects the constitutional amendment. He is now in his early 80s and will be ineligible for the next presidential polls. President Yameen gained the presidency on Gayoom’s popularity and on JP leader Gasim Ibrahim’s backing, but has since carved out his own base of power with hand-picked MPs and ministers. The amendment will bar Gasim, a long-time presidential hopeful, from contesting in the 2018 presidential elections. A team of Chinese technicians began drilling bore holes on the ocean floor today to gather information for the Malé-Hulhulé bridge project. Tourism minister Ahmed Adeeb, economic development minister Mohamed Saeed, and other cabinet ministers attended an inauguration ceremony for the bore hole drilling at the raalhugadu (surf point) area of the capital this morning. Housing and infrastructure minister Dr Mohamed Muiz said at the ceremony that information gathered from drilling the holes will be essential for designing the bridge. Technicians are drilling 29 bore holes that will be six inches wide and 50 metres deep. Four of the bore holes will be on land. Surveys and feasibility studies ahead of the design process are being conducted with free aid and technical assistance from the Chinese government. Muiz said the Maldivian government will seek a developer once the designs are finalised. The project will be financed with a soft loan from the Chinese EXIM bank. The government has previously said the project may cost between US$100million and US$150million. The six-lane bridge will run from Malé’s surf point to the southwest corner of Hulhulé island’s airport runway, Muiz had previously said. China has said it would “favourably consider financing” the bridge project if the design proves feasible, while President Xi Jinping said he hoped the government would call the bridge “the China-Maldives friendship bridge”. The government has said construction of the bridge will be completed by 2017. The tourism ministry has announced plans to build Chinese-friendly hotels and resorts in the Maldives to cater to increasing tourist arrivals from China. 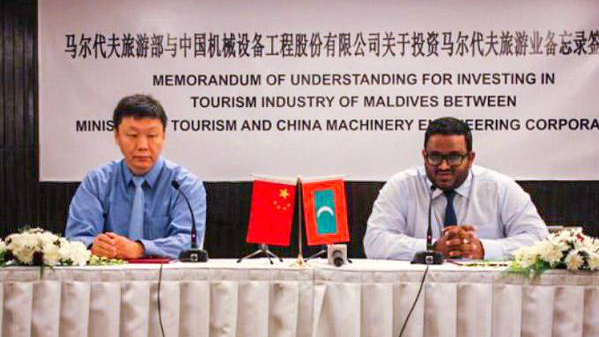 Tourism minister Ahmed Adeeb leased the island of Kalhufahalufushi in Thaa Atoll for resort development to the China Machinery Engineering Corporation (CMEC). The global engineering contractor is set to become the first Chinese company to invest in the Maldives and in the tourism industry. The number of Chinese tourists visiting the Maldives tripled from about 100,000 in 2010 to more than 300,000 last year. With a total of 363,626 arrivals in 2014, Chinese tourists accounted for nearly one-third of arrivals with a 30 percent market share, representing the single biggest source market for tourists to the Maldives. Adeeb said CMEC will now undertake a feasibility study and propose its development concept and other details to the government, adding that a lease agreement will be signed before the end of the year. The tourism minister said he expects CMEC to invest at least US$200 million in the Maldives. He also said islands leased by the current administration for resort development will open for business in 2016. Adeeb claimed development is proceeding rapidly due to concessions from the government, such as waiving import duties for construction material and providing sovereign guarantees for foreign loans. The three opposition parties have welcomed President Abdulla Yameen’s call for talks, but some have called for the release of imprisoned leaders ahead of negotiations. Jumhooree Party leader Gasim Ibrahim in a tweet said his party is ready to commence talks with the government, while Adhaalath Party spokesperson Ali Zahir said the religious conservative party will always heed calls for negotiations called for in good faith. Sarukaaraa eku mashvaraakuran Jumhooree Party othee thayyaarah kamugai dhannavan! Welcoming the president’s call, the main opposition Maldivian Democratic Party’s (MDP) vice president Mohamed Shifaz insisted the party’s imprisoned leadership – ex-president Mohamed Nasheed and party chairperson Ali Waheed – must be able to sit at the table. “We are ready to talk with President Yameen. These are discussions with President Yameen. Our leadership will participate on our behalf,” he said. The Adhaalath Party has also said its detained leader, Sheikh Imran Abdulla, will represent the party in any official talks. The religious conservative party called on the government to “create an atmosphere conducive to dialogue” by releasing Imran and other protesters arrested from the May Day anti-government demonstration. President Yameen’s appeal comes amidst growing international pressure to release ex-president Mohamed Nasheed and ex-defence Minister Mohamed Nazim. The JP, the Adhaalath Party and the MDP formed a coalition in March and continued daily protests over what they called the government’s attempt to silence the opposition. The Maldivians against tyranny coalition have previously called for negotiations and demanded the government release Nasheed and Nazim. However, president Yameen maintains the pair were tried through independent courts, and says he cannot meet the opposition’s demands. The president’s office spokesperson Ibrahim Muaz Ali told Minivan News that the government’s stance has not changed, and the president can only negotiate over lawful demands. Nasheed and Nazim must appeal their respective convictions on terrorism and weapons smuggling, he said. Meanwhile, MDP parliamentary group leader Ibrahim ‘Ibu’ Mohamed Solih told local newspaper Avas that the opposition coalition’s steering committee will discuss the president’s offer before making a comment. The opposition held a 20,000-strong march in Malé on May Day after labelling President Yameen’s overtures at talks “insincere.” The president had appointed tourism minister Ahmed Adeeb as his representative for talks, but the opposition says they will only sit with the president himself. They’ve also accused Adeeb of corruption and illicit connections with gangs, a claim the tourism minister has denied. Nearly 200 people were arrested at the May Day protest and hundreds were injured in a police crackdown. Police used tear gas, stun grenades, pepper spray and baton charges to disperse protesters when they attempted to enter Malé’s restricted Republic Square. MDP’s chairperson Ali Waheed, Sheikh Imran and JP deputy leader Ameen Ibrahim were arrested and remanded for 15 days. The high court released Ameen today, but upheld the remand detention of Waheed and Imran. Meanwhile, the criminal court has reportedly issued an arrest warrant for Gasim over the police’s claim he had funded the May Day protests. The JP leader is in Thailand at present. Specialist Operations (SO) police officers have conducted training exercises ahead of an anti-government mass rally on May 1. 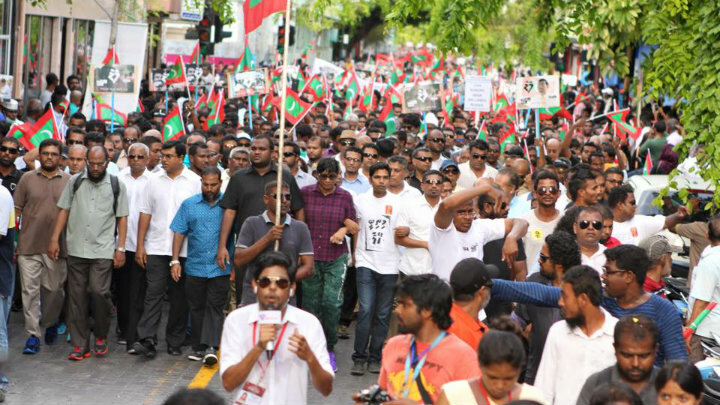 The opposition alliance, made up of the main opposition Maldivian Democratic Party (MDP), the Adhaalath Party (AP) and leaders of business tycoon Gasim Ibrahim’s Jumhoory Party (JP), expects at least 25,000 people to take part in the May Day protest. MDP vice president Mohamed Shifaz told Minivan News that the alliance does not expect a heavy-handed crackdown from police. “We are not talking about overthrowing the government on May Day. We want an end to the brutality shown against Maldivian citizens by president [Abdulla] Yameen’s government,” he said. Leaders of the opposition alliance have been traveling across the country in recent days, holding rallies and urging opposition supporters to converge on the capital on May 1. Last week, tourism minister Ahmed Adeeb challenged the opposition to a confrontation on May Day, prompting fears of a stand-off and civil unrest. Opposition leaders have said the mass rally will force president Yameen to “come to the negotiating table” and discuss the release of imprisoned ex-president Mohamed Nasheed and ex-defence minister Mohamed Nazim. The SO training meanwhile took place on the island of Feydhoo Finolhu during the weekend and involved exercises on controlling protests. 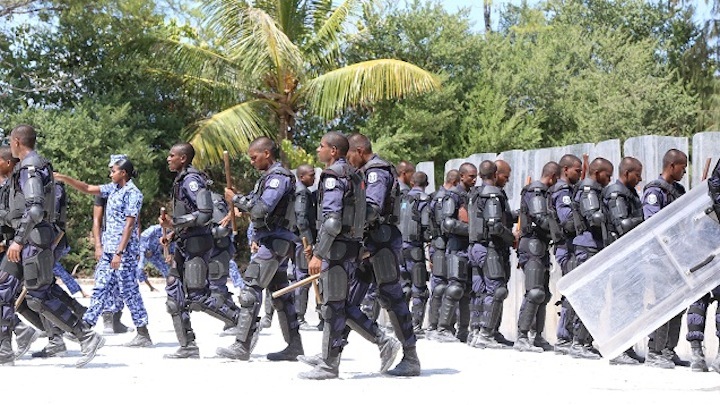 Police said the first round of the training session has concluded and all SO officers and other officers transferred to the department participated in the exercises. Similar exercises were carried out with stun guns and grenades ahead of an MDP-JP mass rally on February 27. In a sermon in Malé on Thursday night – attended by senior members of the allied parties – head of the AP’s religious scholars’ council, Sheikh Ilyas Hussain called on the police and military not to “brutalise” any Maldivian citizen. Ilyas urged police to disregard orders from superiors to use force against the public. Meanwhile, speaking at a futsal stadium opening event in Lhaviyani Naifaru on the same night, Adeeb said the current government cannot be overthrown through street protests. The deputy leader of the ruling Progressive Party of Maldives said only 60 or 70 people were taking part in the nightly protests. The opposition alliance “cannot do anything,” he said. In response, Shifaz said today that the rally on February 27 had considerably more than 60 or 70 people. “We are doing what an opposition party is supposed to do,” he said. Shifaz said it was inappropriate for a minister to mock and challenge the opposition. He suggested that Adeeb and other senior government officials were “unfamiliar” with the new democratic constitution and multi-party democracy. “We were there even at the start of the work and awareness of democracy. Maybe Adeeb is too young to be familiar with ruling through a democratic system and the constitution. How can such people rule the country?” he asked.